This article is about Mii's appearance in Super Smash Bros. 4. For the character in other contexts, see Mii. You may be looking for the fighter info of Mii Brawler, one of the three Mii Fighter types. Mii Fighters (Miiファイター, Mii Fighter) are three newcomers in Super Smash Bros. 4. They were confirmed alongside Palutena and Pac-Man during E3 2014 on June 10th, 2014. 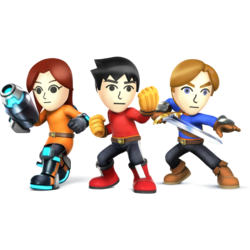 Three variations exist: the Mii Brawler, who relies on physical combat, the Mii Swordfighter, who relies on skilled sword combat, and the Mii Gunner, who relies heavily on projectiles. Mii Fighters cannot be used when playing With Anyone online, but can be used for With Friends online and when playing any offline mode except Smash Tour. As with Palutena, Mii Fighters' custom special moves are completely different from the defaults and are available from the start. Additionally, Mii Fighters will uniquely retain their custom moves even if customization is disabled. However, in Event mode, the Mii Fighters use the same rules as every other character, and will be locked into their default moves unless the player chooses to turn customs on. By collecting Custom Parts and completing challenges, players can unlock several custom outfits and headgear items for Mii Fighters, (for a complete list of these, see here for reference) and as of April 15th, 2015, even more clothing can be purchased as downloadable content. Outfits are usually exclusive to one type of Mii Fighter and all of the ones present in the original release of the game match the Mii's favorite color as set in Mii Maker. Some outfits also change slightly depending on the Mii's gender, (e.g. the "Wild West Wear" outfit is exclusive to Mii Gunners, and the outfit features an added skirt if worn by females). On the contrary, headgear does not change depending on the type, gender, or favorite color of the Mii Fighter. Mii Fighters (along with other custom characters) can be sent between either version of Smash 4. However, Mii Fighters can only be edited on the system they originated from. When the player selects a Mii Fighter on the character-select screen of one version, any Mii Fighters made in the other version will have their portraits replaced with that of a generic Mii depending on its type, with only the name signifying who the Mii Fighter is. Despite this, the character portraits of Mii Fighters will still be replaced with that of a generic Mii when used in Smash Run. Additionally, if one looks at the 3DS version's pause screen during a match with Miis present, the icons that represent those characters are represented by generic Miis as well, and in both versions, amiibos of Mii Fighters will show up as generic Miis when scanned on the character selection screen, although their portraits during matches will properly show them in their true appearance. These scenarios always occur regardless of which system the Miis originated from. As with the gender variants of Wii Fit Trainer, Robin, Villager, and Corrin, there are no gameplay/functional differences between male and female Mii Fighters whatsoever. A Mii Fighter's height and weight depend on what they are set to when the Mii in question was made in Mii Maker, (a feature seen previously in Mario Kart Wii and Mario Kart 8). Miis that are smaller in size are lighter, can jump higher, and move faster (up to 1.2208x walking and dashing, and 1.176x air speed for the shortest and thinnest Miis), while larger Miis jump lower, have slower mobility (down to 0.817x walking and dashing, and 0.8455x air speed for the tallest and fattest Miis), and are more powerful, allowing them to benefit significantly from the new rage mechanic. Mii Fighters cannot be made from special-edition Miis (identifiable by their gold-colored pants); their slots will appear blank in the Mii selection screen. Unlike most in-game uses of Miis, Mii Fighters are not tied to the original Mii data. Editing or deleting a Mii in Mii Maker will not affect any Mii Fighters based on that Mii. Due to this, it is possible to make separate Mii Fighters from the same Mii without having to edit the original. Up to 99 Mii Fighters can be saved on one console, regardless of whether or not they originated from that console. As of Version 1.0.5 of Super Smash Bros. for Nintendo 3DS, players can share Mii Fighters (among other things) both publicly and with friends using the online Share mode (with this functionality later being added to Super Smash Bros. for Wii U in Version 1.0.6). However, like all publicly-shared content, Mii Fighters that are on the server for at least 30 days will automatically be purged. Miis received from Share mode cannot be edited or transferred between versions. Though it is possible to receive a Mii with hacked status boosts via Share mode, any attempts to use these characters in With Friends will get the player disconnected, and banned from online play for 10 minutes for having 'incorrect save data'. Mii Fighters occupy only a single slot on the character selection screen; as such, solo modes will record only one high score for them, despite the three types playing differently. However, the types do have separate trophies to obtain through Classic and All-Star Mode, as well as their own separate amiibo figurines. Likewise, the individual types do not have their own ending movies or Congratulations screens, merely sharing the same one with both of their counterparts. Outside of the Fighting Mii Team, Mii Fighters never appear as CPU opponents in solo modes. Additionally, Mii Fighters will never be chosen when "Random" is selected for a CPU (aside from Attract Mode). To fight against a CPU Mii Fighter, the player must manually select that character. When called out by the announcer, Mii Fighters will simply be referred to as "Mii" no matter their type, though the name of that Mii will still show up on the character select screen, on the damage percentage HUD, and on the results screen after a match. However, in Event mode, the character's name will be "Mii" regardless of what the creator chose. Mii Brawlers fight with brute force using physical attacks such as punches and kicks. They have the best mobility and damage-output of the three types. Their moves take inspiration mostly from other empty-handed characters such as Mario, Little Mac, and Captain Falcon, though a number of their moves are based on empty-handed attacks of other characters who don't necessarily fit that archetype. Brawlers at medium height with default special moves (as is the general formula for the SSB4 tier list) were ranked 56th on the third tier list in the F tier, with their speed and power being offset by their poor range, subpar grab and approach game, along with a poor recovery. Mii Gunners use a variety of high-tech weaponry within their arm cannons to attack foes from afar. They are the slowest of the three types, but (predictably) have the most range. Most of their standard attacks take inspiration from Samus, though their specials have a much broader array of influences, including Ness, Mega Man, Fox, Zelda, and Robin. Gunners at medium height with default special moves ranked 54th on the third tier list in the F tier, owing to their poor mobility, grab game, and lack of long-range KO options despite their range, attack speed and overall versatility. Mii Swordfighters (Sword Fighters in PAL) use their blades and a variety of archaic weaponry to skilfully deal with opponents. They are the second fastest and have the second-longest range, but are the weakest in terms of power. Their moves mostly take inspiration from Link, (right down to having a similar side-taunt), though other sword-wielding characters such as Marth and Ike also influence their movesets to a considerable degree. Swordfighters at medium height with default special moves ranked 57th on the third tier list in the F tier despite their disjointed hitboxes and versatility. Both of these strengths are countered by their slow mobility, lack of reliable KO-setups, and abundance of lag. Iggy encounters a member of the Fighting Mii Team. In Multi-Man Smash, the Fighting Mii Team (謎のMii軍団, Mysterious Mii Corps) appears as an opposing horde of Mii Fighters with uniform height and weight. Like other enemy teams, they are weaker than standard characters, being unable to use special moves and have limited defenses. Each fighter wears a black uniform which differs slightly based on the Mii Fighter type, with a white 'M' logo and two of the letter 'i' on their limbs to spell 'Mii'. Any Mii on the player's system can appear as a Swordfighter, Brawler, or Gunner, regardless of what types of Mii Fighters have been created. They lack hats even if the original Mii in the player's system does, and do not change their facial expressions in battle. The following table outlines how a Mii's weight and height affects its statistics. Each number represents how much a value is multiplied at maximum deviation from default; any value within the range is possible. Both values are multiplied together to obtain the final value; for example, the skinniest and shortest Mii has a ground mobility of 1.09 * 1.12 = 1.2208. All statistics not mentioned are constant regardless of size. In general, a Mii's height is much more important than its weight. Mii Fighters have gotten among the worst results in tournament play, and arguably suffer from the poorest representation among the cast, due to debates on their legality (see below) as well as their general unpopularity as characters. Notable Mii players include Dapuffster, who primarily mained the Mii Brawler; Nyani, who mains the Swordfighter; and Rom, who mains the Gunner. The Mii Brawler is generally considered the best of the three Mii Fighters when customs are allowed, and is a potential high or even top tier with them. All Mii Fighters are considered considerably worse without access to their customs, and as the tier list currently does not recognize custom movesets in its ranking of characters, the Brawler ranks at 56th, Gunner at 54th, and Swordfighter at 57th. With the universal ban on custom moves at major tournaments after EVO 2015 and a playstyle that revolves around customisation, Mii Fighters have not seen much tournament play. While most tournaments do allow for Mii Fighters to be used, varying rulesets have been featured for the characters. The Miis used can only be "Guest Miis", with predetermined heights and weights, along with a singular, specific, and non-modifiable moveset, such as 1111 only. The Miis used are restricted to only "Guest Miis", with predetermined heights and weights. Players, however, can use any combinations of special moves that they desire. The Miis do not have to be Guest Miis, but their heights and weights cannot be changed. Players can use a variety of preset, specific movesets for the Miis, but these combinations cannot be modified, as part of the Official Custom Moveset Project. In spite of these rulesets, Mii legality is still a subject of debate in the competitive community. As previously mentioned, custom moves are generally banned in competitive play, leading to this debate; some tournaments allow Miis to have full access to their custom moves, while others only allow for 1111 movesets. In smaller tournaments where custom moves are legal, there also exists debate as to what extent players can be allowed to modify the heights and weights of their Miis. Abraham Lincoln's mock-up introduction picture. Elijah Wood's mock-up introduction picture. Shinya Arino's mock-up introduction picture (replacing Ice-T in the Japanese trailer). AKB48 member Mayu Watanabe's mock-up introduction picture. AKB48 member Yuki Kashiwagi's mock-up introduction picture. AKB48 member Minami Takahashi's mock-up introduction picture. Mii Fighters as they appear in Multi-Man Smash (left). Various Miis wearing many different kinds of costumes. Mii Fighters' height differences. The Mii in red is visibly shorter than the Miis in black and pink, while also being as tall as the crouching Mii in white. Some of the Swordfighters' specials. Two Mii Brawlers of different sizes vs Mario. Mii Swordfighter vs Meta Knight. Mii Fighters are the first playable characters that represent the Super Smash Bros. series. By extension, this makes the Mii Fighters the first enemy team characters to be fully playable. While technically starter characters, Mii Fighters do not appear on the character selection screen until one exists on the system, thus making the Mii Fighters the only unlockable characters that do not have to be fought against to be unlocked. The Mii Fighters, Pac-Man in Super Smash Bros. Ultimate, and Captain Falcon in Super Smash Bros. are the only playable characters whose stock icons do not depict the character's head or body. The Mii Fighters are the only playable characters in the entire series who do not appear as opponents in All-Star Mode. Mii Fighters can sometimes be seen in demo sequences. However, the Mii Fighters won't have any custom headgear, and will always wear the male version of the Standard Outfit, even if female. Even though the announcer voice clip "Mii" is used, there are unused clips of the announcer saying "Mii Brawler", "Mii Swordfighter", and "Mii Gunner". These voice clips would later go on to be used in the Mii Fighters' appearance in Super Smash Bros. Ultimate. Individual portraits of each of the different types of Mii Fighter that would appear on the character selection screen exist in the game's code, though these are actually used for customized searches in Share mode, displaying a Mii Fighter amiibo, and for when the individual Mii character's appearance is loading or fails to load. The outfits worn by the Miis representing AKB48 members for the special commercial features are the Vampire Garb for Brawlers, the Pirate Outfit for Swordfighters and the Mage Robe for Gunners. Coincidentally, the Mii Fighters share the same weapon types as the three third-party DLC characters: Ryu being a Brawler, Cloud being a Swordfighter and Bayonetta being a Gunner. This page was last edited on January 22, 2019, at 06:10.